With high-flying acrobats like Cisco and Lucent, IPO sideshows such as China.com, and tantalizing tales of rags to riches, Wall Street in the 1990s was a massive global carnival affecting billions of people throughout the world. 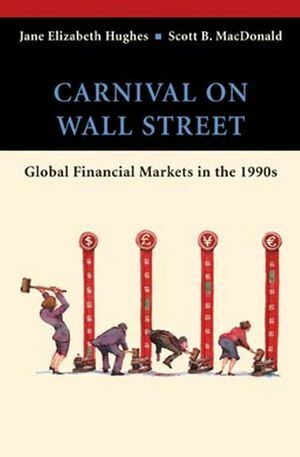 Carnival on Wall Street examines the roots of the blind faith in free markets, globalization, technology, and financial models that both fueled and ultimately doomed global financial markets in the 1990s. Authors Jane Hughes and Scott MacDonald guide readers through the factors--financial, economic, and political--at work in the Wall Street stock market bubble. Both entertaining and easy-to-read, the text takes an applied approach that brings this fascinating decade to life through intriguing anecdotes about real people and real events. Jane Elizabeth Hughes is the author of Carnival on Wall Street: Global Financial Markets in the 1990s, published by Wiley. Chapter 1. Introduction: Greed, Greatness, and Disaster. PART I: THE GLOBALIZATION OF CAPITAL MARKETS. Chapter 2. Wall Street: From Furs to Global Capital Markets. Chapter 3. Emerging Markets: Good Money After Bad? Chapter 4. Foreign Exchange Markets: Speculators, Policeman and Suckers. Chapter 5. Return of the Neo-Luddites: Globalization and Antiglobalization. PART II: WALL STREET: BUBBLE TO BUST. Chapter 6. The Tech Bubble. Chapter 7. The Firm and Globalization. Chapter 8. A Decade of Financial Wrongdoing. Chapter 9. Japan and China: Potential Asian Earthquakes. Chapter 10. 9/11 and Beyond: It's the Symbol, Stupid. Globalization and business: This book links the intensely controversial and important debate over globalization to the world of business in new ways. The chapter on the globalizers versus anti-globalizers is a serious and scholarly view of a critical issue that has suffered from too much hyperbole and too little real examination. Ethics: This text contains a great deal of discussion on ethical issues including corporate governance, financial wrongdoing, and money laundering - as part of the broader picture of financial markets in the 1990s. Applied approach: The authors present the material from an applied, rather than theoretical, perspective. They offer brief explanations of key theories (financial crises, foreign exchange markets, etc.) with references on where students can obtain more detailed information.